The OSU Titan TEM with ChemiSTEM capability. The Titan is now regularly used to generate high quality STEM EDS maps using its four Bruker SDD detectors. 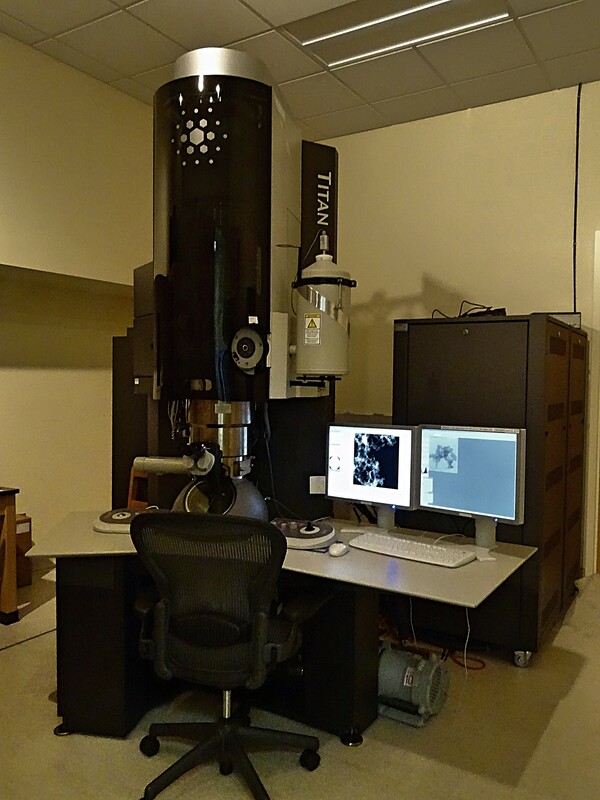 It also has recently been used to generate published Tomograms of nanomaterials for internal OSU customers. In addition, the accelerating voltage can be reduced to 80 keV for enhanced contrast on lower molecular weight samples from Biology and or Graphene. Field emission electron source, XFEG for high brightness and stability compared with Tecnai. Triple Lens that enables variable convergence angle on the multifunction knobs for fine tuning CBED and or EELS data. EFTEM and EELS via a Tridiem GIF. Thickness maps, EFTEM maps and EELS spectra are a snap with Digital Micrograph - Microscope control integration. Cryogenic stage and transfer station for frozen specimen microscopy also supports the cryo ultramicrotome we have in house.